How do I enter the "License Key" to unlock the Test Version? How can I exclude the timestamp from "Order: abcd 2016-02-01"
Error Message "No Source Fields defined ... Nothing to do here"
Error Message "No Account selected"
Error Message "No Table selected"
How to store large text fields (>255chars) in an Excel sheet? How can I enter one of the header fields, e.g. the sender email address to my database? warning The program does not save the "Column Relationship" when using an Excel sheet as target. comment How do I enter the "License Key" to unlock the Test Version? Click on "Settings" and "Enter License Key" after you purchased a license. Enter your license key and click on "Validate". Define the "Column Names" (field names) by typing in the names in the first row. Important: Don't use spaces, commas, ", ', ... in the column name! Add a sample row (record) and define the field types by formatting the cell(s), e.g. data type "Date", "Integer", etc. MS Excel auto detects the correct data type in most cases. Make sure, that you add a complete sample row including all cells. If you don't add a sample line all data types will be defaulted to 255 chars. Add more than 255 chars in the sample cell for large text fields. Make sure that the column names in the first row of the Excel Sheet have no extra spaces at the beginning or at the end. Such additional characters are often added inadvertently by the user when copying and pasting. Sample: Change "Name: " to "Name:"
The first row contains the "Column Names", e.g. Name, Email, Date, Total and the second row contains a sample record with the data type definition (use the Excel format cell functions). Format each cell which should not be text, e.g. "07.11.2014" as "Date" and "199" as "Number"
If you don't add a sample row, then all columns will be treated as text with max. 255 chars! Important: Changing the data folder using Folder > Data Folder > Change Folder creates a new blank program database. This equals a restart from scratch. The new program database will NOT contain data connections or information about processed messages from the previous data folder. All messages in the inbox will be processed again! The ODBC driver cannot update the database or sheet because the Dropbox client has locked the file during the Dropbox synchronization. Please disable/end the Dropbox client when running the program or move the target database/sheet out of the Dropbox folder. comment How can I exclude the timestamp from "Order: abcd 2016-02-01"
Please download and re-install the program (it's not required to uninstall the software). If you have installed MS Office 16 (365) also take a look at this page. This ensures, that no manipulated SQL statement could be used for SQL injections. If you access the database values using a third-party application or script, then you should do the same or filter the values before you run any SQL call containing one of the values. There must be a space between date and time! This happens quite often when people have used the excel sheet before. Please scroll down and search for the records. There are empty rows before the record. The program adds the new records after the last "used" row/line in the excel sheet. If you have e.g. deleted the cell contents, but not the whole row in Excel, then you will get empty lines/rows. You can fix this easily by selecting the empty lines, right-click and remove the whole rows (not just the content). Install Inbox2DB on the new computer and run it once. Don't create a new data connection! Exit the program on the new computer. Start the computer on the old machine and locate the "Data-Folder" in "Settings". The "last modified" date of program database file "inbox2db.accdb" should reflect your last use. If you cannot locate the custom "Data-Folder" location: search for "inbox2db.accdb" on your computer. Exit the program on the old computer. Now copy/replace the "Data-Folder" on the new computer with the files from the old computer. 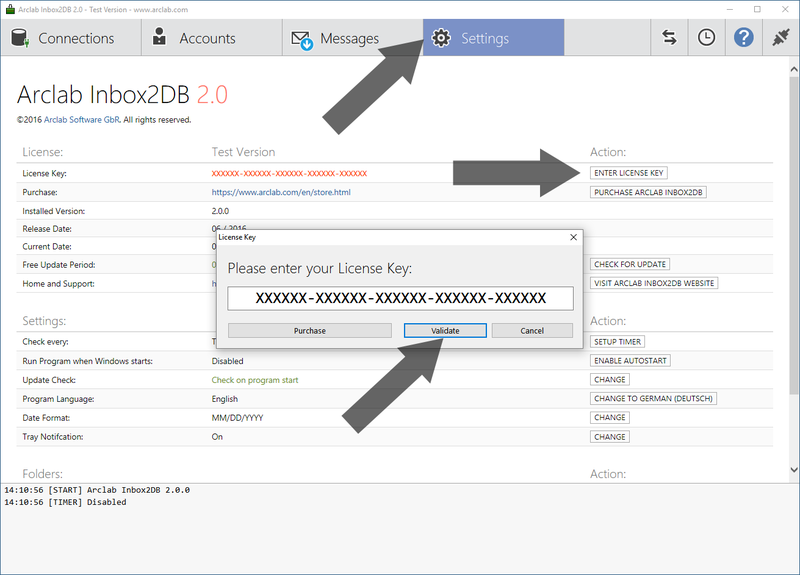 Run Inbox2DB on your new computer and enter your license key. comment Error Message "No Source Fields defined ... Nothing to do here"
The program cannot synchronize the connection because you have not defined any source fields. Please edit the "Connection" and define source fields using "Edit Relationship". comment Error Message "No Account selected"
The program cannot synchronize the connection because you have not specified the source (email) account. Please edit the "Connection" and select the source account for the connection. comment Error Message "No Table selected"
The program cannot synchronize the connection because you have not specified the target database table or sheet. Please edit the "Connection" and select the data connection target. No "Database" was selected in the ODBC connection configuration. Edit the ODBC/DSN connection (or create a new ODBC DSN) and select a "Database" in the configuration. The database does not contain any tables. The specified user has no permissions to access/view the specified database. Check the database/table permissions of the database. comment How to store large text fields (>255chars) in an Excel sheet?" Insert a sample line (below the field names) to the sheet and add more than 255 chars in the sample cell for large text fields. The error "ExecuteSQL failed: E: String data, right truncated..." is shown if the char or text field in the target database is too small and the program cannot insert the (long) string extracted from your email into the (small) target database field. Solution: Edit the target database structure and change the field length (or field type) to the needed size. Google blocks (by default) third-party mail clients like e.g. Outlook, Thunderbird or Inbox2DB. Google calls third-party applications "less secure". This means you can only access the Gmail account from the Gmail web interface or using a Google application unless you allow "less secure" apps. Now the program should be able to access messages on the Gmail account. Edit the "Data Connection", scroll down to "Data Connection Settings" and click on "Edit Relationship" to define the source fields. First you need to ensure that the target field in your database (field type) is large enough to store the complete message text. Important: This function stores the extracted message text (as shown in the preview). Please take a look at "Email Source and File Attachments", if you want to save the complete (unmodified) message source instead. The program adds FULL-MESSAGE-START at the start of the message text and FULL-MESSAGE-END at the end. Please follow the steps below if you want to restart using a blank installation. Warning: This will permanently delete the connection settings, information about processed messages and all log files! The program will re-process all messages in the email account's inbox if you re-create the same connections! Locate the "Data Folder" in "Settings > Folder > Data Folder"
Make sure you have a copy of your license key! Click on "Settings > Enter License Key" to view/copy the license key. You need to unlock the software again after the restart. Exit the program completely. Make sure it's not running in the system tray! If you cannot delete the folder, the program is still running. comment How can I enter one of the header fields, e.g. the sender email address to my database? to select the sender "From Address" (email address). Important: Create the unique "Shared Mailbox Alias" with the mailbox! comment The program does not save the "Column Relationship" when using an Excel sheet as target. Please check the column names in the first line of the Excel sheet and remove extra spaces before and after the column names. "Name: " > change to "Name:"
" Name:" > change to "Name:"